Andrea D. (top) and Julia G. show off Golden Tickets with Oxy Gene. Photos courtesy of Community Transit. From a Community Transit News Release. Everyone on Community Transit’s Route 435 bus the morning of June 19 was expecting an average commute, but what they got instead were gratitude and gift cards – including two worth $250. Oxy Gene, the agency’s transit superhero, boarded the bus at Canyon Park Park and Ride and proclaimed to everyone aboard that he was there to thank them for riding transit by rewarding each person with a prize. As the bus made its way to the Mountlake Terrace Transit Center, everyone was handed a prize envelope, then opened them on Oxy’s cue. Most envelopes contained Starbucks gift cards valued at $5. Julia G. from Maltby and Andrea D. from Bothell each received a golden ticket worth $250 at Starbucks. Julia was having a lucky day indeed, because this wasn’t even her regular bus. After realizing she didn’t have her ORCA fare card with her, she ran into a coffee shop – yes, a Starbucks – to get change to pay cash fare and missed her usual bus. 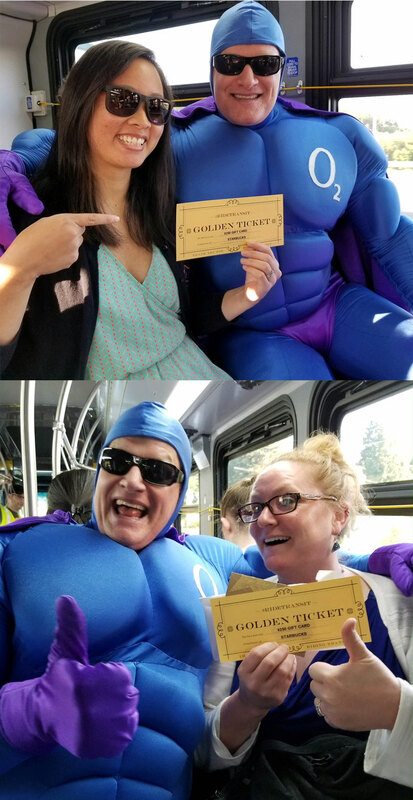 Julia and Andrea chatted with Oxy Gene after revealing their golden ticket, thanking Starbucks and describing their favorite reasons to ride the bus. See a short video of their conversations at bit.ly/RideTransit2018. The surprise event, called Transit for the Win, is sponsored in partnership with Commute Seattle as part of Ride Transit Month, which aims to celebrate transit riders, showcase the benefits of riding transit and encourage people who don’t normally ride to give it a try. Transportation agencies all over the state are participating in Transit for the Win, surprising lucky riders with prizes and golden tickets on ferries, buses and trains on various days throughout the month of June. Other Ride Transit Month activities include prize giveaways to riders who log their transit trips at RideshareOnline.com, pledge to ride at least three times in June, complete weekly actions, or share their transit stories on social media with the #RideTransit hashtag. More information about Ride Transit Month can be found at RideTransitMonth.org. Community Transit is responsible for providing bus and paratransit service, vanpool and alternative commute options in Snohomish County. The agency is building a network of Swift bus rapid transit lines, with Swift Blue Line along Highway 99 and Swift Green Line, between Canyon Park/Bothell and Boeing/Paine Field, coming in 2019.